Becoming a Better Help Meet: Remind Yourself! Today I just want to share a simple little thing I do to remind myself all day that I think my husband is awesome! This all came about rather innocently. I didn’t intentionally create this little exercise so that I could remind myself of how much I love Matt. It just happened, and then I realized how cool it was. It’s profound…are you ready?! I set one of my computer passwords (one that I use frequently) to say something great about Matt. I was feeling giddy one day, and I needed to set a new password…and so just like I was in junior high writing “I LOVE MATT” on the side of my notebook between classes, I set my password to say it. But don’t you remember those feelings you felt back when you and your husband were dating and you couldn’t stop thinking about him and you wanted to carve your initials together into a tree? And tell all your friends about how great he was? And write his name on stuff? Somehow life takes over and reality sets in and we as a couple become comfortable and not so giddy anymore. That’s mostly okay. We don’t really have time to sit around and sigh and daydream. Typing in the words reminds me several times a day of how much I love my husband. And in the middle of a very busy life full of activity and just…busyness…those reminders are a valuable treasure. So, just a suggestion: Set up a password or two to say something great about your relationship with your husband. You’ll appreciate the loving reminders! I’ve been giving a lot of thought lately to marriage, in particular we can help our husbands be godly leaders and the kind of men we need and desire them to be. I know many of you have experienced a lot of hurt and disappointment in your marriage. Many of you want your husbands to step up and be a stronger spiritual leader in your home. Whether your husband is leading your family the way he should be or not, I thought you might enjoy this song that touched me heart recently. I told you that listening to music ministers to me! When I heard the the words of Lead Me, by Sanctus Real, I fell in love with the message. I realize this song is directed more to men…as encouragement to let God lead them as they strive to lead their families. Maybe you’ll have an opportunity to share this song with your husband. Plus, I thought it would give us all some great words to pray as we ask the Lord to help our husbands be strong and to meet our needs. I’ve been using the words of this song to pray for several of our friends who are struggling in their marriages. In addition and maybe more importantly, I think this song can be a heart check for each of us as wives. Are we being the kind of wife our husband needs? Are we loving our children the way we should be? Are we letting our husbands lead? 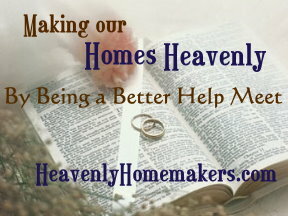 Are we fulfilling the roles in the home that we should be? Do our husbands and children feel supported by us, or do they feel alone? And no matter what, always remember that God is in control and that he loves you and is holding you up. When we got married, we had quite a few expectations about what we thought marriage would be like. I personally had quite a blissful view of what it would be like to be a wife and homemaker. My kitchen would always be clean. My chores would always bring me joy. I would always be rested, organized and cheerful. My husband would always say and do exactly the things I needed and wanted him to say and do. We would have beautiful children who were well behaved and quiet and who never argued. Oh, and of course, some of those beautiful children would be of the girl variety. Fifteen and a half years later, I am a (very happily married) woman with a frequently dirty kitchen and a large list of unfinished chores that occasionally make me feel very grumpy. I could use a nap and I have to pray and put forth quite an effort to continually be cheerful. My husband certainly doesn’t always say and do exactly what I need him or want him to do. None of my children are of the girl variety…and hardly ever are they quiet. Am I disappointed with all of these expectations that have gone unfulfilled? No way. I’m still doing everything I always wanted to do…I’m just living within the realm of reality now. The fact that God gave us four boys has been joyful beyond my wildest dreams. I could never keep a perfect house because well…we’re all living in it. My husband can’t possibly say everything and do everything perfectly because as great as he is, he is also human and for goodness sake..sometimes I don’t even know what I want. How is he supposed to know? I am going to suggest then that while we absolutely should aim high and desire a wonderful life with a wonderful man of God…we also need to recognize that there is no such thing as a perfect life with a perfect man. If there was a perfect man out there…he wouldn’t be choosing the likes of me because well…I’m not perfect. I have more to say about expectations, specifically with our husbands, but I’ll share that another time. For now I’ll stop with the simple idea that as a help meet to our husbands we need to learn to be joyful while we live lives that are less than perfect. Lives that may include spills, mistakes, socks on the floor, stains on the rug, bad breath, hurt, death, sickness, sore backs, misplaced documents, dried out markers, toilet seats left up, squishy bananas under the table and lost library books. Embrace the life God gave you with the husband you chose. Let go of perfect expectations…and choose JOY!